In much the same way every picture tells a story, each tree in your San Antonio landscape can also tell a story with the addition of tree lighting. Trees as a species naturally have a great deal of character. Each tree has a distinct personality all its own such as the weeping branching of the willow, to the overreaching embrace of an oak; no two trees present themselves identically. For example; the character and effect that is interpreted through lighting a mesquite tree is far different from the interpretation conveyed through lighting a palm tree. Choosing specific trees within your landscape for tree lighting can breathe new life into your landscape and give your entire property a distinct feel. If you are just starting out with a new landscape or outdoor lighting installation we can help you decide which conifers deliver the most dramatic effects, and which will thrive best in San Antonio’s climate. Here is a look into just a few of the best tree lighting candidates for your landscape. Both the Honey Mesquite, Velvet Mesquite and it’s smaller cousin the Screwbean Mesquite, are Texas natives and are extremely drought tolerant. The wide, drooping branches have made this tree one of the most popular among homeowners seeking drama in their landscape in the daytime and in the evening. They range from a few feet to 10 to 15 feet in height, although the Honey and Velvet Mesquites may reach 30 to 60 feet in favorable settings. They may have single or multiple-branched stems, with each plant assuming its own distinctive shape. They come armed with thorns on the smaller branches. They shed their leaves in the winter. They bloom from spring into summer, bearing small frothy-looking clusters – called “catkins”of tiny, five-petal, pale green or yellowish flowers, luring numerous beneficial, pollinating insects. From crown to root tips, Mesquite trees have evolved a number of adaptations especially designed to help assure survival in their desert environments. This beauty not only has the classic, haunting “willow-esque” characteristics of others in the willow family it also dazzles with a brilliant show of delicate flowers. 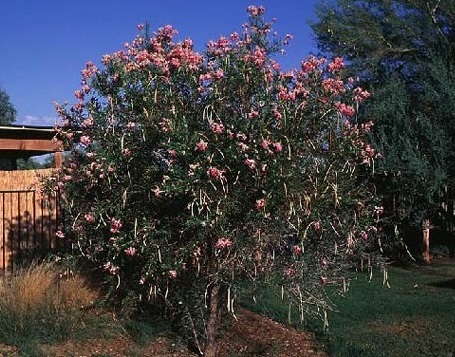 The Desert willow (Chilopsis linearis) is also perfect for Texas landscapes as it will withstand abuse when it comes to poor soil and drought. Its weeping form is airy with foliage that casts enough shade making the space around its base suitable for many other plants. There are several varieties on the market. The standard form bears pink blooms with dark pink features. ‘Bubba’ produces reddish/burgundy blooms and the blooms of ‘Regal’ are even deeper burgundy/purple. It can reach 15 to 30 feet in height and will reward you with almost care free beauty for years to come. This plant thrives in full sun and well-drained soil. It can reach 15 to 30 feet in height and is easy to care for and maintain. The Palm Tree – The only palm tree native to the San Antonio is the Texas Sabel Palm, however, our climate also allows palms native to other regions to thrive. These include the Windmill Palm and the California Fan Palm. Palms trees appropriate for our climate range from small specimens to large, with branch variations from large to small fanning of the leaves. Palms have a unique branching structure that is all their own. In addition to their fanning leaves, they have an abundant overlapping branching pattern that is beautiful to look at and makes a wonderful focus of tree lighting designs. The bark, wide caliber of the trunk and height of palms exudes majesty and presence and is one of the most requested tree by our customer to use as a focal tree lighting candidate. Palms are very exotic and can transport your senses to a place where you can leave your cares behind and relax with a fruity drinkin your hand. 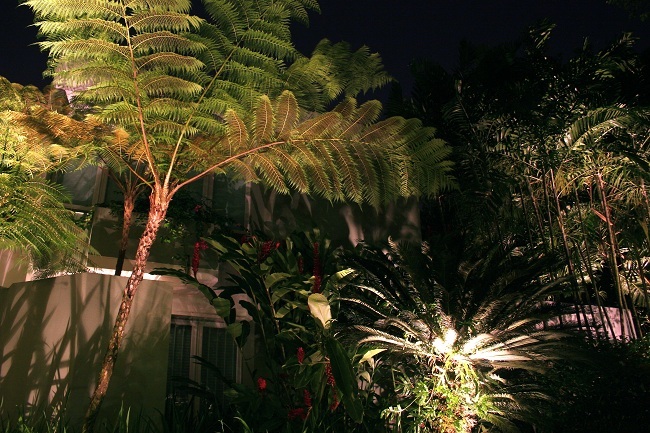 By adding tree lighting to the palm trees in your landscape, you can take yourself to an exotic far-away place without ever leaving your own backyard. The exquisite tree lighting at this home in San Antonio leaves an impression on everyone that passes this stunning home and landscape. In order to bring out the character of any tree you choose to highlight, we make the unique characteristics shine through by using various tree lighting techniques. 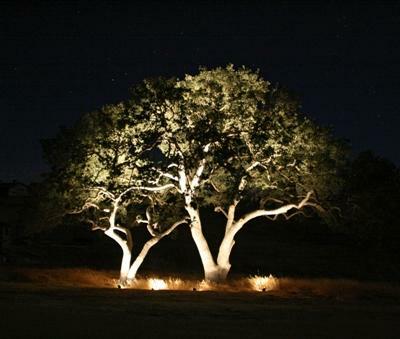 Up lighting is used to accentuate the trunk and height of a tree. Well lights are often used at the base of a tree to play up the trees width and girth, and down lighting and moon lighting are often used to accentuate the canopy and add drama to the tree and the area around the tree. We treat each tree as a separate entity with our tree lighting designs because what works for one tree best, will not necessarily work for another. Professional tree lighting is an art we take seriously. We also pay special attention not to damage or alter your tree leaving it susceptible to fungus and disease when installing your tree lighting fixtures. A healthy tree is a beautiful tree for years and years to come. 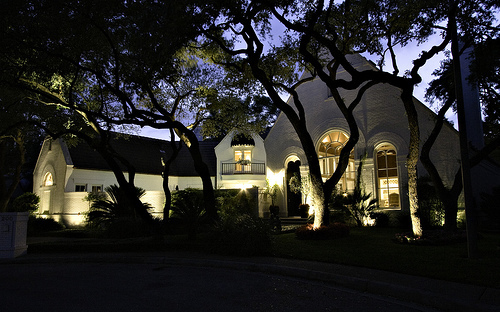 Our tree lighting designs are an effective way to bring out the best in your San Antonio landscape, and improve the way your entire property looks in the evening. Tree lighting and landscape lighting also gives you added security and plenty of curbside ambiance too. I am constantly asked which trees offer the most benefit to the home and landscape when used in landscape lighting, or focal tree lighting designs. Homeowners want to take advantage of the best aesthetic return by making sure to choose the right tree(s) in their landscape for tree lighting. 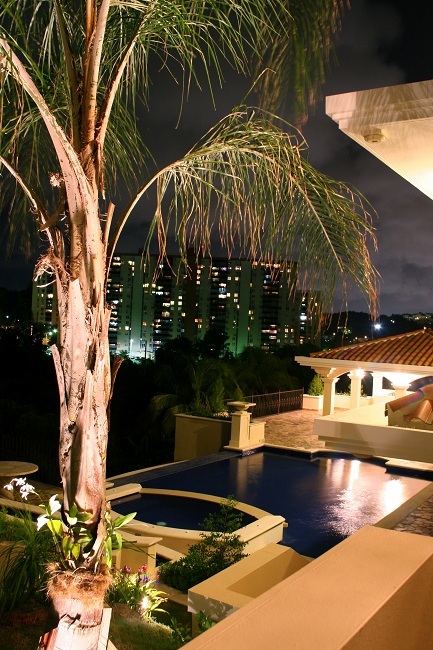 When you are looking for the biggest bang for your buck when it comes to outdoor lighting, the genre of outdoor lighting that will ultimately be the most dramatic is tree lighting. Trees as a species naturally have a great deal of character. No two trees present themselves identically. 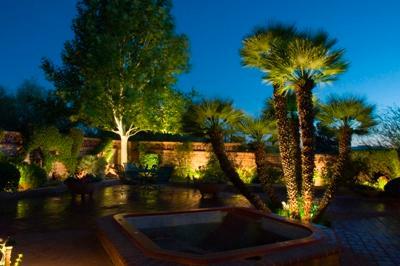 For example the character and effect that is interpreted through lighting a mesquite tree is far different from the interpretation conveyed through lighting a palm tree. Choosing specific trees within your landscape for tree lighting can breathe new life into your landscape and give your entire property a distinct feel. To prove my point, I am going to take two trees that are commonly used in San Antonio landscape designs and by example show you the way various trees can make you feel when you add tree lighting. Palms trees and mesquite trees are two beloved trees of the landscapes in our area. Palms exhibit a unique branching structure that is all their own. Their abundant overlapping branching pattern is beautiful to look at and makes a wonderful focus of tree lighting designs. The bark, wide caliber of the trunk and tall height of palms exudes majesty and presence and is one of the most requested tree by our customer to use as a focal tree lighting candidate. Palms are very exotic and can take your senses to a place where you can leave your cares behind and relax with a fruity drink. 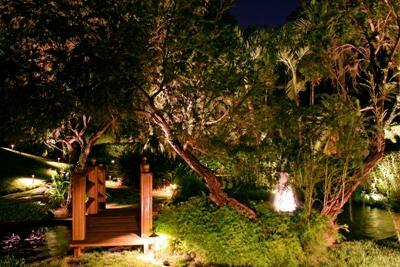 By adding tree lighting to the palm trees in your landscape, you can take yourself to an exotic far-away place without ever leaving your backyard. Mesquite trees are hauntingly beautiful trees. Their outstretched and weeping, curved limbs create a branching pattern that conveys wisdom and elegance in the landscape. When Mesquite trees are lit they cast shadows in the areas surrounding the tree that mimic light dancing from the glow of a full moon; eerie and beautiful at the same time. Lighting mesquite trees in your landscape is a great way to add mystery and drama to the curb appeal of your home as well. In order to bring out the character of each individual tree and makes the unique characteristics shine through we use various tree lighting techniques. Up lighting is used to accentuate the trunk and height of a tree. Well lights are often used at the base of a tree to play up the trees width and girth, and down lighting and moon lighting are often used to accentuate the canopy and add drama to the tree and the area around the tree. We treat each tree as a separate entity with our tree lighting designs because what works for one tree best, will not necessarily work for another. Professional tree lighting is an art we take seriously. We also pay special attention not to damage or alter your tree leaving it susceptible to fungus and disease when installing your tree lighting fixtures. A healthy tree is a beautiful tree for years and years to come. Our tree lighting when paired with our expert landscape lighting designs can bring out the best in your landscape, and improve the way your entire property looks in the evening. 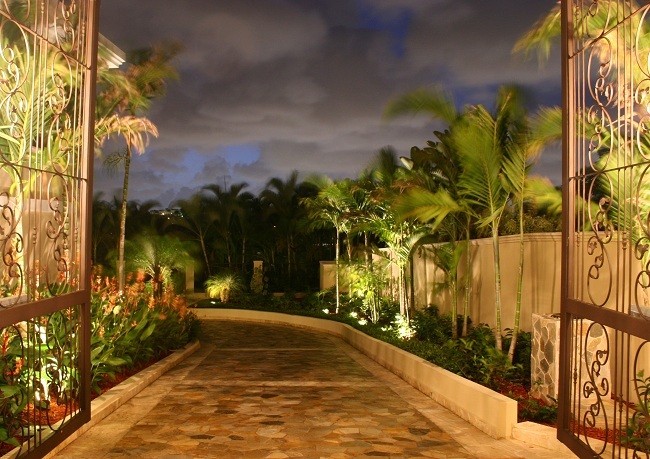 Tree lighting and landscape lighting also gives you added security and plenty of curbside ambiance too. You can also visit our landscape and garden lighting gallery located on our website to see more stunning example of tree lighting designs in your area.